For the first time, when developing a product, I did not have the raw material as a first inspiration. Whilst developing the prototype I kept searching for an inspired packaging to use for the sleeve – alas, every paper I found that had an inspiring print tore because it was not the right type. However, an exciting opportunity came from this search because 1) the Plain Brown Sleeve actually looked great and 2) this presented the opportunity for us to create our own designs. So I contacted three graphic designers that I admire and asked them if they would be interested in creating a surface print for this product. Aimee Lottering (who designed the PPC Cement Laptop Bag packaging bag), Daniel Ting Chong and Lauren Fowler all agreed. As with every new product there are hurdles and this one was not without: the paper turned out to be very special and the papermill also closed, the printer got it wrong more than once and almost 9 months later I can finally say: HERE IT IS! 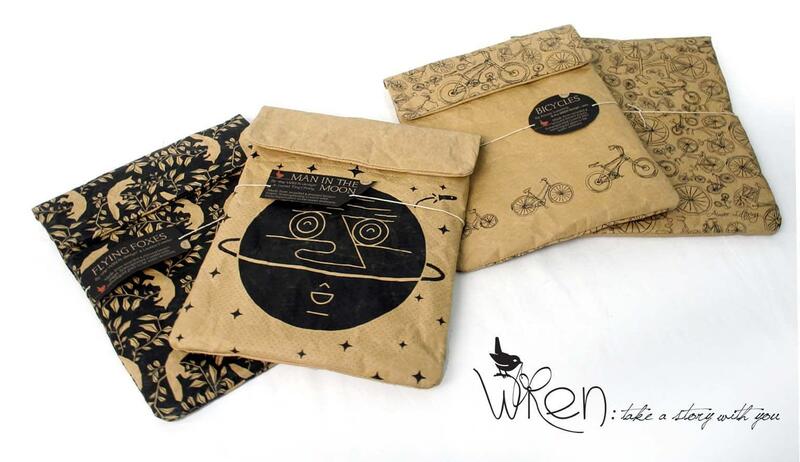 Aimee Lottering designed the BICYCLES sleeve. “My aim was to create meaningful illustrations that show-cased car-free living and that this form of living/traveling will eventually be seen not as restrictive, but rather a newfound freedom. …and i just love bicycles, the fun, quirky, sustainable and get you from a to b.” Aimee Lottering, Graphic Designer and Illustrator. Daniel Ting Chong designed the MAN IN THE MOON sleeve. “I was fascinated by the technology of the iPad and how futuristic in some way it was. So I thought it would be fun to depict an Outer Space scene. As you open the cover it says ‘Lift Off’ to give a sense of fun every time one would open the cover to immerse themselves with your iPad.” Daniel Ting Chong, Graphic Designer. Lauren Fowler designed the FLYING FOX sleeve. “I took advantage of this project to design my first step and repeat pattern. I love foxes and plants, so I combined the two!” Lauren Fowler, Thing maker, illustrator and graphic designer. This entry was posted in Blog and tagged Designer, ipad, paper, printed, recycled, screenprint, sleeve, tablet. Fantastic Laptop bags,Wendren! Great material/paper! You are so creative and you have such good ideas!